This pool house is partially open to the air, but still covered by a solid roof. Extra storage for pool toys was provided by building this pool house with a covered porch. 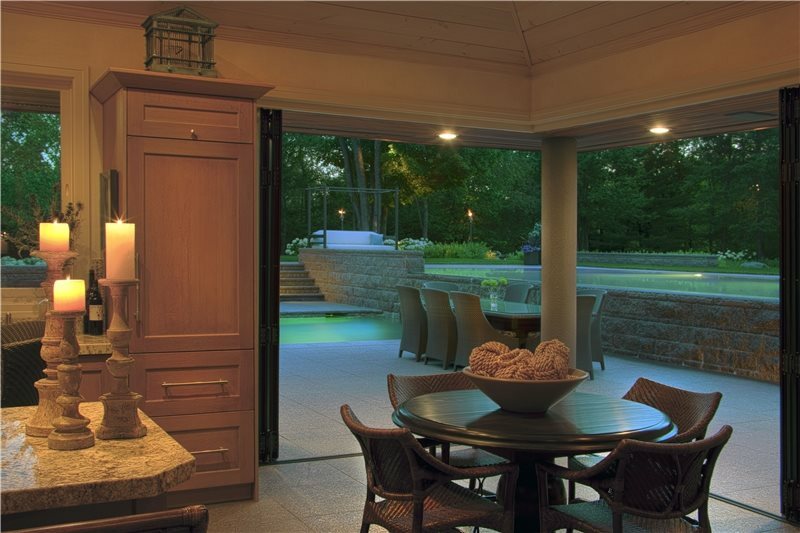 This pool house was set back from the water line to provide plenty of outdoor dining space. Remodeling the garage to include a pool house extension means you can build upon existing utilities instead of laying all new. This glassed in pool house extends from the barn where more expansive indoor space allows use all year around. This backyard features the ultimate sports bar cabana complete with a bathroom, solid roof and ticker tape. Note the screen panels used to enclose this pool house porch solves problems in buggy climates. A pool house is just that, a second house on the property which can include a second kitchen, game room or even a spare bedroom for guests who want their privacy. Pool houses require full utility hook ups and a building permit with all its requirements and approvals. 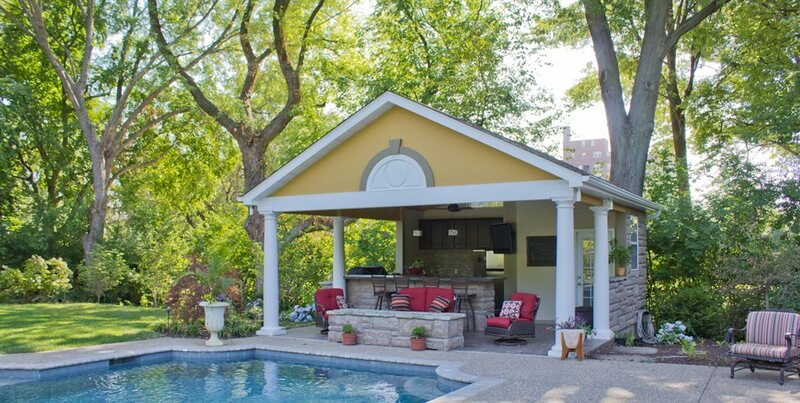 The term cabana is often used interchangeably, but this is not a pool house. It is a three-sided roofed structure designed to provide shelter and privacy at pool side. Some can be built with a permit while others prove so abbreviated they are little more than a tent. 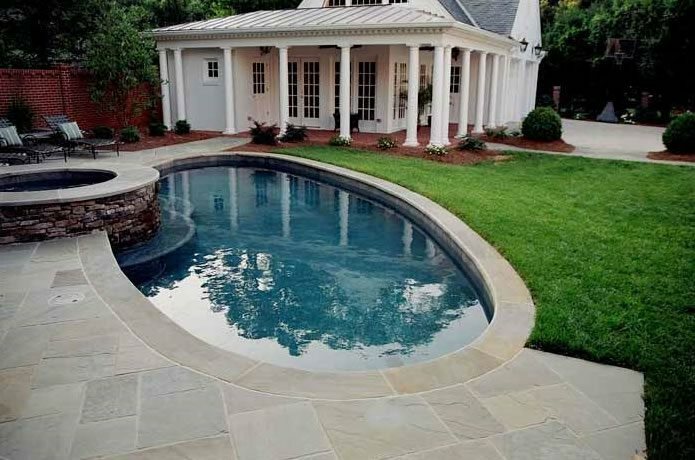 Whether you are planning a pool house with all the accoutrements or one that is designed for equipment storage and a changing room, it first and foremost is part of the overall landscape. These structures are so large they cannot be disguised or hidden in planting. High cost demands this become an integral element that enhances the surrounding landscape and views from both indoors and out. To get it right the first time, keep these four cornerstones in mind to make the most out of this major amenity. Because the pool house is so large, it cannot be ignored. In fact, it's almost always a major backyard focal point. That forces you to create a structure that is visually appealing to look at and integrates seamlessly with your home's architecture by repeating materials, colors and finishes in its facade. 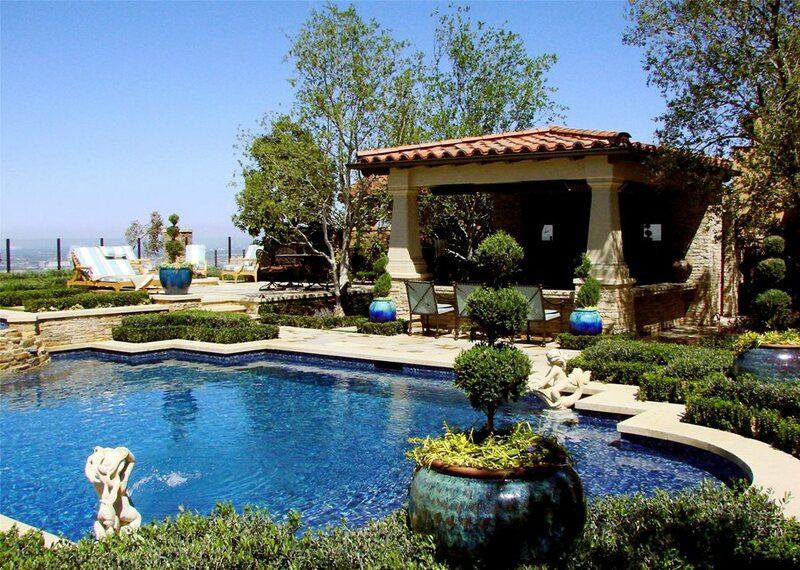 When you look out to the pool, the pool house should blend in as though it was created with the house. 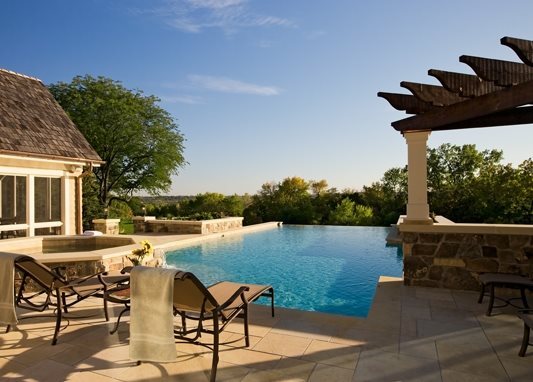 Similarly, when looking from the pool house back to your home, the view should be equally as integrated. This visual link connecting both structures has a powerful impact on the overall landscape. 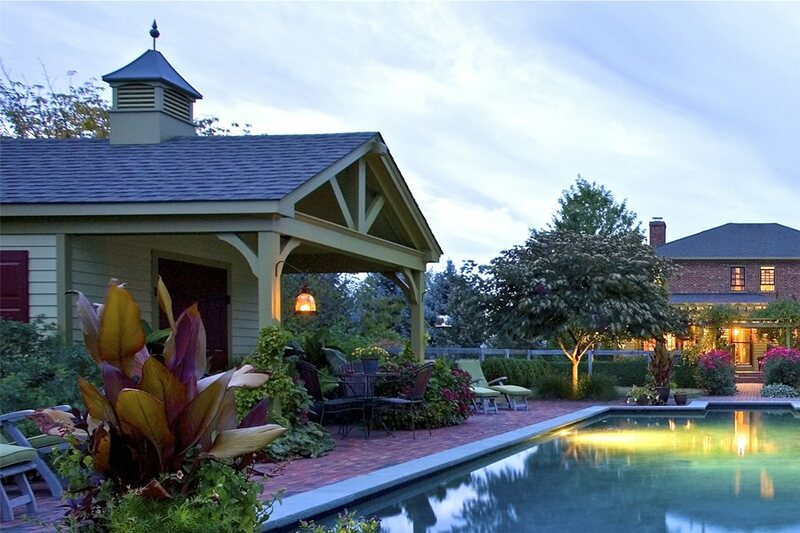 Pro Tip: Don't underestimate the importance of outdoor lighting on the facade of a pool house. It should be subtle and ambient except for sconce fixtures which create patterns of light on walls and columns. Existing conditions and building codes dictate the ideal position for this structure relative to property lines. The space created by property line setbacks should be used for storage of items such as bikes or firewood so they aren't crowding spaces around your house. 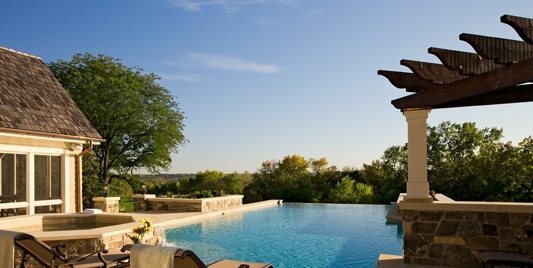 Strike a balance between the structure's distance from the pool and the property line to utilize every square inch of space you can. Strive to preserve trees both on and off site. Your neighbor's trees may provide the perfect background for your structure if it is well positioned, reducing the demand to plant and maintain your own. On-site trees and existing older hardscape elements if appropriate should also be preserved as part of the site planning process to save money because both of these are expensive and time consuming to replace. Often, such elements can dictate the overall size and shape of a pool house when it must be designed with respect to crowding or problematic existing conditions. Every pool house will be unique to its users. The constellation of indoor and outdoor spaces can include a bar, covered patio, fireplace, and all the detailing that goes with them. In rainy or very hot climates, a covered patio is not uncommon, and this is where an outdoor fireplace or grilling center should be located under the solid roof. The more open this living space to the view from the house, the greater opportunity you have to create a visual amenity. Pool houses almost always face the pool itself with little space between the facade and the pool water line. 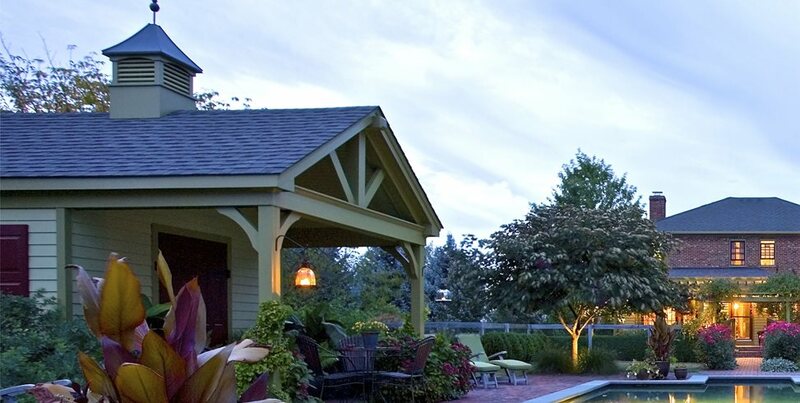 Open beam arbors on one or more sides can double or triple your outdoor living space. 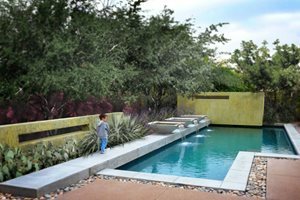 When it is built in a symmetrical setting relative to the pool, a pair of matched arbors, one on each side can increase usable space and make the structure more beautiful. But not all pool houses are laid out that way. 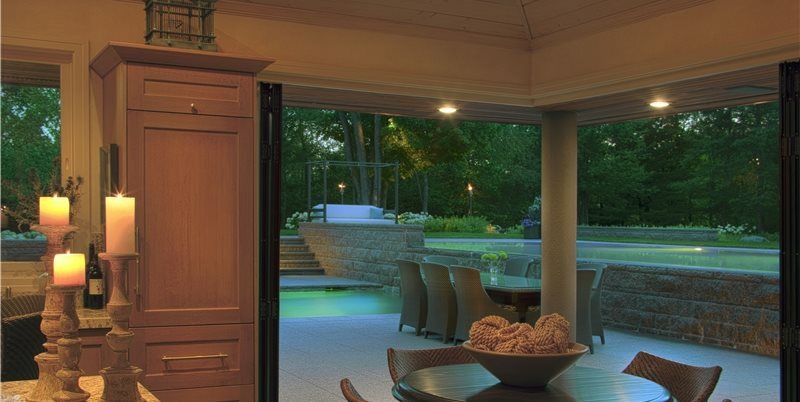 In buggy climates, the pool house provides the perfect opportunity for outdoor living. The front porch can be screened to allow outdoor living without mosquitoes. Canvas curtains on the porch can help to mitigate problems such as side light in the summer and wind. Net, muslin or shade cloth curtains allow only filtered light to pass through. Symmetrical: Equal on both sides, a formal landscape design. 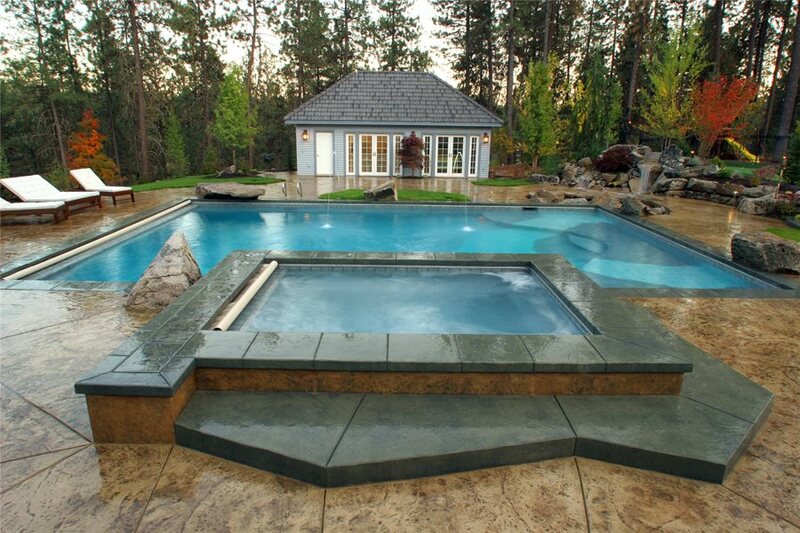 If your landscape is symmetrical, your pool house should reflect this in its location. Often uses elements and plants in pairs. Curvalinear: Irregular, naturalistic layout. Often uses elements in odd groups of three to five. 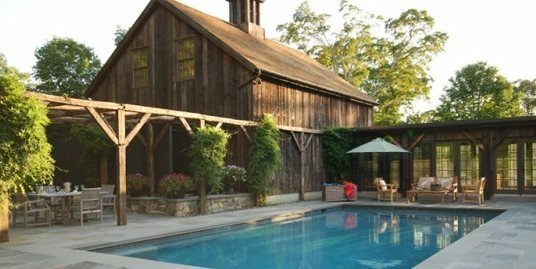 A pool house isn't just an amenity for entertaining. Most of them are used for overflow storage plus pool and gardening equipment and supplies. This means you must provide suitably sized access ways to make it easy for the pool caretaker to bring in supplies of chlorine, acid and bags of salt without having to squeeze through narrow pathways or gates. This is doubly important if the dead zone behind the back of the pool house and the property line is to house outdoor storage such as firewood or a clothes line. 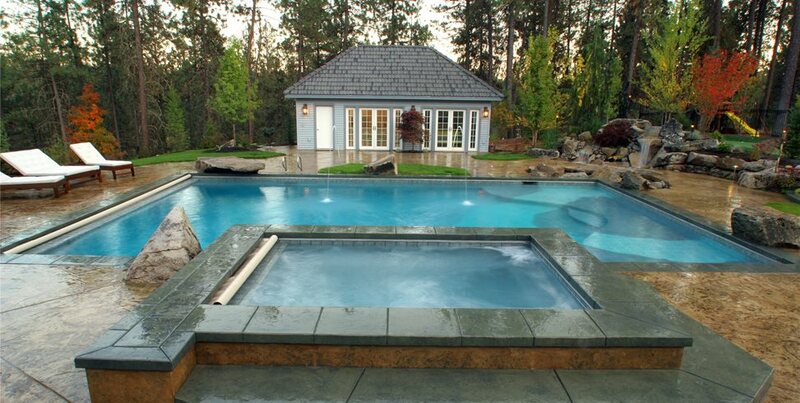 Be conscious of the location of the bathroom or changing room in your pool house. Wet bathers will be going back and forth with bare feet, and salt or chlorinated water dripping from them can damage many kinds of plants. Thus the link between this bathroom door and the water should be slip resistant, easy to negotiate and intuitive, especially for kids. Plants with thorns or spines. 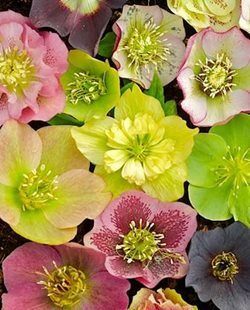 Plants with flowers that attract bees. Plants with fine leaves that disintegrate in water. Planting is vital for nesting the pool house into the landscape. 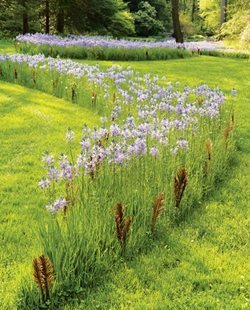 The goal is to ensure the planting plan becomes an extension of the pre-existing landscape. This is even more important when the project involves strong themes such as a Hawaiian look with tropical plants or a dry Mediterranean scheme. Look at the view of the pool house as a landscape tableau where you will spend time scantily clad during the warmer months. Background planting is key to privacy and to set up a beautiful staged tableau viewed from indoors in every season. That means you'll want lots of interesting accent plants to hold the view in the off season when you aren't swimming. 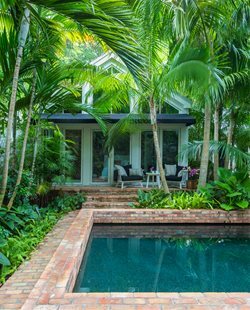 For the summer months, provide background foliage or along the side boundaries of the property, integrate the pool house into your privacy needs. It's also ideal for mitigation of unattractive neighboring structures or land uses. Above all, ensure that the species your designer uses do not generate litter that can become a problem for the pool. 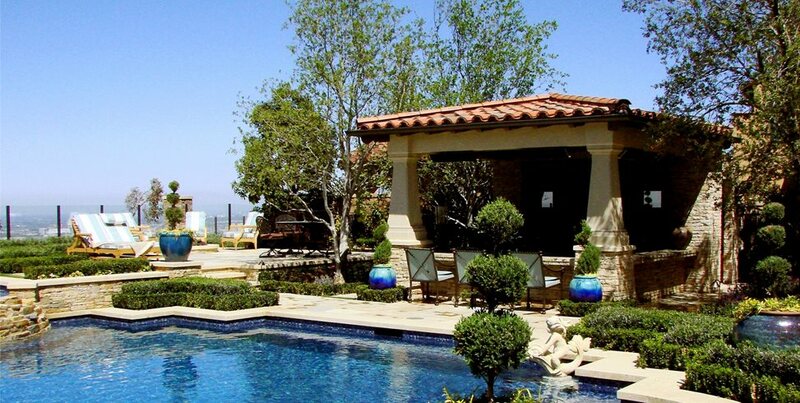 So whether you are adding a pool house or cabana to your new home landscape or remodeling an existing homesite, pay close attention to the details that ensures it functions as intended. Above all, strive for that first glance wow-factor as guests take it all in from existing house to pool house and beyond.